In a large bowl, beat together the cream cheese, beer, and ranch packets until smooth and creamy in appearance. After that, stir in the cheese. I turned the hand held mixer to a lower speed and combined it that way. You could serve the dip right away, but its best if you cover the bowl and refrigerate for at least 1-2 hours. That way the flavors have time to combine. 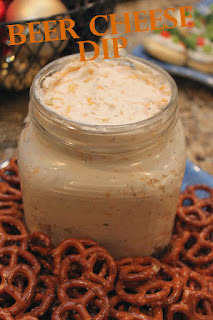 You could also make this dip a day or so ahead of time.